Liu Miao, Wang Jianhua, Wang Shengshu, He Yao. Liu Miao, Wang Jianhua, Wang Shengshu, He Yao. 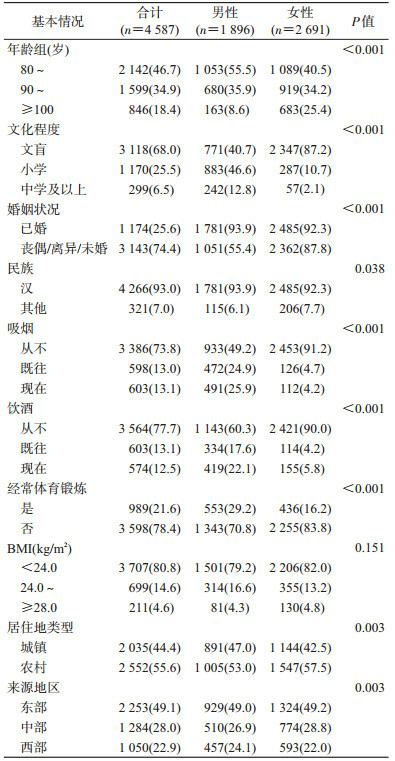 Blood pressure level, hypertension prevalence and control status in oldest old in China[J]. 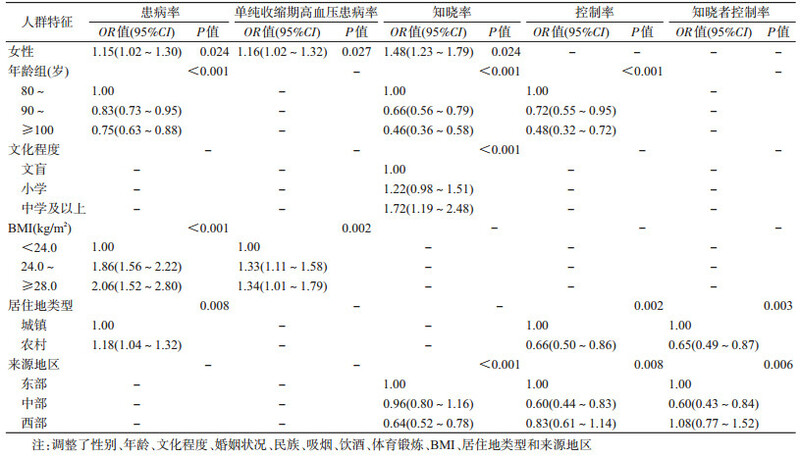 Chinese Journal of Epidemiology, 2019, 40(3): 290-295. Abstract: Objective To investigate blood pressure level, hypertension prevalence and control status in the oldest old in China. Methods A cross-sectional data set of Chinese Longitudinal and Health Longevity Study (CLHLS) in 2014 was used to investigate the blood pressure level and hypertension prevalence and control status in the oldest old. Results A total of 4 587 elderly people aged ≥ 80 years were surveyed with mean age (91.3±7.8) years old, including 1 896 males (41.3%). The mean SBP was (139.5±22.0) mmHg, DBP was (79.6±11.8) mmHg, and the pulse pressure difference was (60.0±18.7) mmHg. The prevalence rate of hypertension was 56.5% (95% CI:55.1%-58.0%), the awareness rate of hypertension was 52.2% (95% CI:50.3%-54.1%), the control rate was 11.5% (95% CI:10.3%-12.5%), and the control rate of those with awareness of hypertension was 22.2% (95% CI:19.9%-24.4%). Age, gender, BMI, residence place and living area were related to blood pressure level and control status of the oldest old. Conclusions The blood pressure level and the prevalence of hypertension in the oldest old in China were different from those in developing countries and adults in China, while similar to that in the younger elderly in China. The prevalence rate of hypertension was high and the control rate was low. Age, gender, BMI, residence place and living area were related with blood pressure level, hypertension prevalence and control status. 中国人口与发展研究中心课题组. 中国人口老龄化战略研究[J]. 经济研究参考, 2011(34): 2-23. Research Group of China Population and Development Research Center. Research on the strategy of population aging in China[J]. Rev Econom Res, 2011(34): 2-23. 中国老年医学学会高血压分会. 高龄老年人血压管理中国专家共识[J]. 中国心血管杂志, 2015, 20(6): 401-409. Zeng Y. Introduction to the Chinese Longitudinal Healthy Longevity Survey (CLHLS)[M]//Yi Z, Poston DL Jr, Vlosky DA, et al. Healthy Longevity in China. Dordrecht: Springer, 2008: 23-38. DOI: 10.1007/978-1-4020-6752-5_2. 中国高血压防治指南修订委员会. 中国高血压防治指南2010[J]. 中华心血管病杂志, 2011, 39(7): 579-616. 白旭鹏, 姚依群, 武云涛, 等. 高龄老年高血压患者动态血压特点[J]. 中国循证心血管医学杂志, 2010, 2(1): 17-20. 刘爱东, 李剑虹, 米生权. 1997-2009年中国部分省区成人高血压流行趋势及影响因素分析[J]. 中国健康教育, 2012, 28(12): 991-995. 种冠峰, 相有章. 中国高血压病流行病学及影响因素研究进展[J]. 中国公共卫生, 2010, 26(3): 301-302. 董烨华, 冯文. 我国老年人高血压管理情况的社会影响因素分析[J]. 中国全科医学, 2017, 20(34): 4310-4314, 4321. 赵天明, 王增武, 张林峰, 等. 我国北方35岁及以上农村居民高血压患病情况及影响因素分析[J]. 医学研究杂志, 2015, 44(1): 20-24.